For over 100 years now, there have been heated debates of Evolution vs. Creationism. A debate which has a way of seeping into our daily lives, and now, once again, into our school systems.On October 5Th, the Council of Europe, responsible for the European Convention on Human Rights, declared an end to the teaching of Creationism in schools, stating "if we are not careful, creationism could become a threat to human rights." This, to me, seems a bit harsh. Now, I'm not saying that I strongly believe one way or another, but I do believe it is irresponsible of the European government to ban the referencing to this proposed view. I think that we all have the right to be made aware of all the possibilities, however controversial they might be, so we can make our own, educated decision about the world we live in. There is amazing evidence of evolution. It is happening around us as we speak. But I think it is still important to provide ALL the facts, especially in a high school setting, where students are at a stage where they are in the process of deciding in what they do and do not agree with. I also found it interesting how quickly our societies view on the matter has changed in such a short time span. For example, look back to the 1925 John Scopes "monkey" trial, when a Tennessee high school biology teacher was prosecuted for teaching Charles Darwin's theory of evolution. Now, we've made so many advances in the theory of evolution, with the help of the fossil record and molecular biology, that the opinions of most have changed tremendously. I guess all I am saying is that, like anything else we are taught in school, we should be presented with all the arguments so that we can make an informed decision for ourselves. Nice post. Just a couple of comments and maybe some points for discussion. "Creationism is a theory, not a science, and as such, should not be taught in classrooms. But then why do we refer to it as the "theory" of evolution..."
'Theory' in a scientific sense has a much narrower definition than the everyday English meaning of 'guess or conjecture'. It's more like a model explaining a related set of observations based on experimental evidence. Scientific theories are both predictive and testable. While it's true that a scientific theory can be proven incorrect, it represents a general consensus in the scientific community of a description of reality. I just wanted to clarify that because I think evolution/creation discussions often get derailed by a confusion of the scientific meaning of 'theory' with the everyday use of the word. "I guess all I am saying is that, like anything else we are taught in school, we should be presented with all the arguments so that we can make an informed decision for ourselves." 1)What version of Creationism would we teach? Young Earth Creationism proposes that the Earth is 6000 years old and all evidence points to the contrary. 3)Where do you draw the line? Do we then start letting alchemy be taught in the chemistry classroom? Astrology alongside astronomy? I agree that it is important for students to be exposed to the various theories of creation. It is important; however, as kamel said,to provide students with a clear definition of theory. Teachers need to provide a framework in order for students to critically think about the theories provided. Whether the traditional views of science or a general consensus are applied makes an important difference in how theories are accepted. 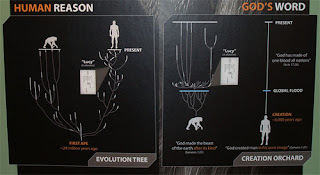 The christian view of creationism is enormously popular in much of North America; however it cannot be taught using the same theoretical guidelines as evolution. How then can we teach various theories simultaneously in an unbiased way?